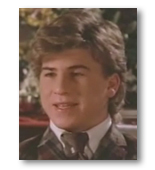 In "The Wonder Years", Jason Hervey plays the part of Wayne Arnold, Kevin's brother. • In 1985 he played a small part in the movie "Police Academy 2: Their First Assignment"
• At the age of 16 he gained the role for Wayne Arnold in "The Wonder Years"
• After "The Wonder Years" ended, Fred Savage and Jason Hervey didn't see each other for 10 years. After meeting again, together they synchronized a movie. This time, Jason played the young and weak brother while Fred was the big, annoying one. So this was kind inverting "The Wonder Years". • Jason had a brother like Wayne had been in the series. Some of the conflicts between Kevin and Wayne are based on real incidents between Jason and his brother.